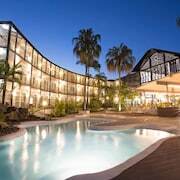 Beautiful loaction, well appointed rooms and amenities, quiet end of Airlie Beach but easy to get to most things on foot. Where to find Hayman Island hotels near an airport? Where can I find hotels in Hayman Island that are near tourist attractions? Although hotel options within Hayman Island are few and far between, Expedia's wide-ranging database lists a large number of hotel options for the surrounding area. Even though it can be a challenge to find a place in Hayman Island, it's good to know that Expedia lists about 24 fine options within a 19-mile (31-kilometer) radius. The Pinnacles Resort, Queensland, which is the closest hotel, is located 19 miles (31 kilometers) from downtown Hayman Island. Another option is the Daydream Island Resort & Spa, which is in Queensland, 16 miles (26 kilometers) from the heart of Hayman Island. 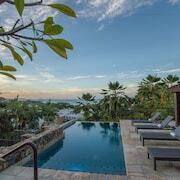 19 miles (31 kilometers) away from downtown Hayman Island, is the Mantra Boathouse Apartments. 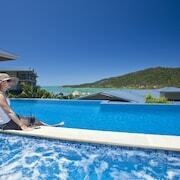 Alternatively, the at Waterfront Whitsunday Retreat is 19 miles (31 kilometers) away. 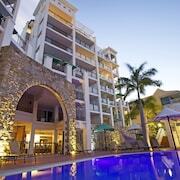 The Coral Sea Resort as well as the Peppers Airlie Beach are two other places to stay in Hayman Island. If you are inspired to see some more of the beaches, rainforest and streams that feature in this part of the world, you could also plan some time in other destinations in Whitsunday Coast. No matter if you enjoy common activities, for example hiking and shore fishing, or simply travel around to see the sights you will be able to reserve suitable accommodation in the vicinity. Another place to stay is Hamilton Island, which is 20 miles (32 kilometers) to the north of the heart of Hayman Island. This is the place to find the Hamilton Island Golf Club, Catseye Beach and Hamilton Island Marina. 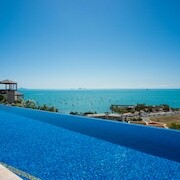 Accommodations in Hamilton Island include the Beach Club and Reef View Hotel. 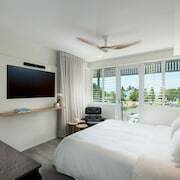 For those travelers planning on arriving through Great Barrier Reef Airport, you may like to stay at Beach Club, or Reef View Hotel, which are both a short distance away. What are the most popular Hayman Island hotels? Are there hotels in other cities near Hayman Island? What other types of accommodations are available in Hayman Island? Explore Hayman Island with Expedia.ca’s Travel Guides to find the best flights, cars, holiday packages and more!